The holidays are fast approaching, and retailers are readying their stores and sites for what may be the biggest year ever. Thanks to a strong economy, eMarketer predicts that US retail sales will climb 4.1%, and US retail ecommerce spending will increase 16.2%. In keeping with historical trends, much of that growth comes from Black Friday and Cyber Monday. But exactly what kind of increases can retailers expect this year on these key shopping days? And what other days bring in high volume? 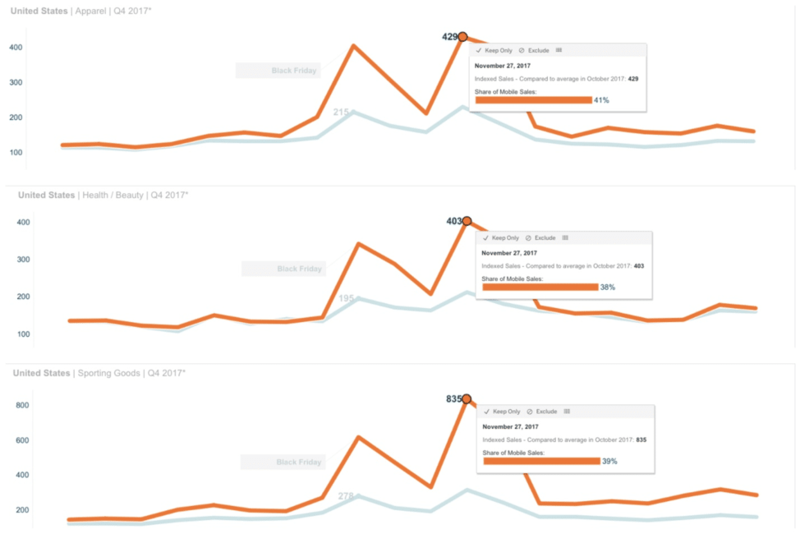 With the help of the data in our Seasonal Sales Dashboard, let’s take a look at the 5 biggest holiday shopping days, including increases in indexed sales and visitors across different retail categories. For our purposes, we focused on the US, but our Seasonal Sales Dashboard has data for 15 additional countries. We also limited the specific category data to Apparel, Health & Beauty, and Sporting Goods for the US, but there’s lots more to play with in the dashboard! In our Global Black Friday Report, we dove into just how big this shopping day has become across the world. The data below shows the spikes from 2017, and we expect they may be even larger this year. In the US, for All Retail, Black Friday 2017 saw sales spike almost 400% compared to the average in October. 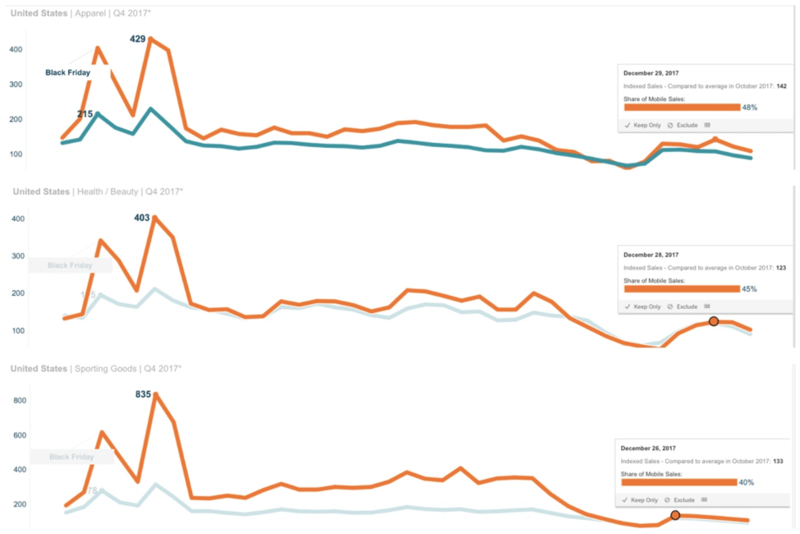 If you’re celebrating the Festive Season in Europe, be sure to check out our new Black Friday dashboard to see just how much the American phenomenon has spread across the Atlantic. 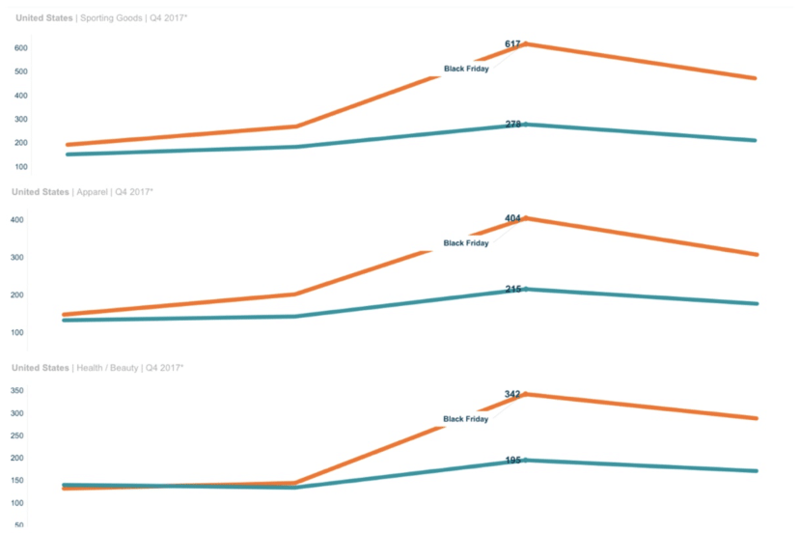 Perhaps you’ve never heard of it (because we coined the term), but our data shows that shoppers are still buying in a big way the day after Black Friday, too. In the US, for All Retail, sales on the day after Black Friday were 247% above the October average. Ever since its introduction in 2005, Cyber Monday has steadily grown. Last year, Cyber Monday sales increases nearly equaled those on Black Friday, reinforcing what we know to be true about the ongoing shift to digital shopping. Green Monday, sometimes also called Cyber Monday 2, falls on the second Monday of December, and is regarded as the 3rd largest online shopping day of the year. As you can see in the chart below, it doesn’t rival Black Friday, but still shows a sizeable increase – +186% last year. This is perhaps the greatest hidden opportunity of the shopping season. The week between Christmas and New Year’s is the period when shoppers flood back in market to take advantage of online deals. Gift cards, cash, and returns that turn into additional product purchases all make this week a sales bonanza. The US saw up to a 46% increase in online retail sales between Dec 26th (Boxing Day) and Dec 31st. Apparel saw the biggest increase, with a sales uplift of up to 42% during the week. Health & Beauty and Sporting Goods retailers saw sales increases of up to 20-30% during the week. Don’t blow your entire budget on Black Friday and Cyber Monday—save some spend for other key days to keep sales consistently coming in. Optimize for mobile. The charts here show that mobile accounted for 40% or more of sales on any given day. This is predicted to be even bigger this year, so be sure that your mobile presence is delivering on expectations, including things like responsive design and persistent carts across devices. Use personalization to increase conversions. Ads with personalized product recommendations and personalized coupons will help you stand out by helping shoppers find just what they needed, just when they needed it. Increase CPCs to stay competitive. Don’t miss out on clicks because of bidding wars or budget caps – increase bids and budgets to ensure full visibility. Make more instants that matter. A customer-centric strategy is about understanding and catering to each shopper’s unique journey, with an end goal of creating more moments that matter—whether it’s that moment at the register when a shopper could scan coupons from your app, or that moment that you sent them just the product they were looking for (but didn’t know it yet). For more holiday research and insights, download The Criteo Holiday Report: Moments, Trends, Research below! *Criteo Seasonal Sales Dashboard baseline: Index values are compared to average in October 2017.